﻿ Juventus 1-4 Real Madrid. Back-to-back European champions! 03.06.2017 » Juventus 1-4 Real Madrid. Back-to-back European champions! And that's how History is made! Real Madrid became the first club to win back-to-back Champions League titles since the new format was introduced in 1992-93. The Merengues beat Juventus by 4-1 in the final, with two goals from Cristiano Ronaldo and a goal each by Casemiro and Asensio. Real Madrid are the kings of Europe once again, this time after beating Juventus by 4-1 in this year's final played in Cardiff. 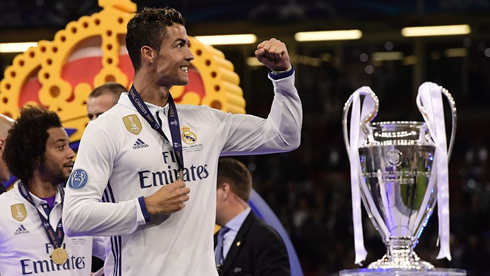 It was another remarkable performance by Cristiano Ronaldo, who scored twice against Buffon and helped Los Blancos wrapping up their 12th European Champions title. It almost didn't feel real at times. The movement, the passing, the danger. It was vintage Real Madrid all over the pitch. Four goals to one. 4-1! "La Duodécima"! It still doesn't seem real. It's the first time a team repeats a Champions League win. The 12th title. Amazing! Zidane's men ultimately showed why they were the favorites to lift the trophy in Cardiff! And best yet, it was vintage Real Madrid in every sense of the word. In the first half Juventus were more than worthy opponents, in fact, it often seemed as if Madrid were overmatched early on, but this is Real Madrid and this is our tournament. 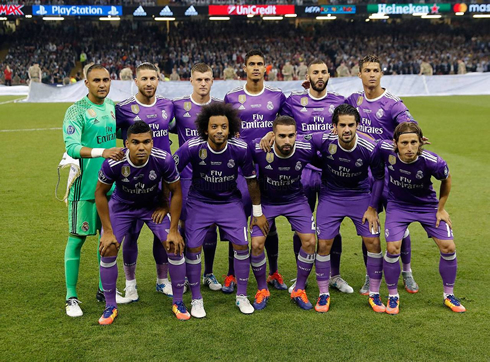 Zinedine Zidane's men were able to turn a 1-1 score at halftime to a 4-1 victory by the end of the match. And who was it? Who could it be but Cristiano Ronaldo with a double in the final, to seal what's likely to be his 5th Ballon d'or trophy. It was a fantastic final for the neutrals, with a lot of end-to-end football and great goals on both sides. First Ronaldo with a sleek finish early, to put Madrid 1-0 up in the 20th minute. Joy and jubilation all around. Soon after, however, Juventus were back level as the Croatian Mario Manduzkic scored a fantastic overhead kick only seven minutes later. Everything back to square one... Match on! Juventus threatened throughout the rest of the half, but Madrid were able to hold on and went into halftime a bit dissatisfied at their performance. Whatever Zidane said at halftime worked, because the Real Madrid team we saw after the break was a changed side. They won every 50/50 ball, the passing was spectacular, the movement, the sharpness. They looked like... Real Madrid! And soon the goals would flow, first a deflected effort from the Brazilain Casemiro, then Ronaldo's second on the night, a close-range finish after some fantastic work from Luka Modric on the right. The celebrations had begun. Marco Asensio would continue his tradition of scoring in finals with a late goal following some brilliant work from Marcelo and at that point. it was all a formality. Real Madrid are the first team to repeat as Champions in the modern European Cup (Champions League) and Cristiano Ronaldo ends the tournament as top scorer with 12 goals. Messi dropped to second place in the rankings with 11 goals. From those 12 goals Ronaldo scored, a whopping 10 of them came in the knockout stages this year. Brilliant! Cristiano Ronaldo next game is the Champions League final on June 3 of 2017 against Juventus. You can watch Juventus live stream, Latvia vs Portugal, France vs Paraguay, Portugal vs Cyprus, Northern Ireland vs New Zealand, and Golden State Warriors vs Cleveland Cavaliers, all matches provided from our live sports game pages.